Krakow officially has a new gallery – the 70 million złoty Museum of Contemporary Art in Krakow (MOCAK). Among other VIPs invited to the opening were Krakow’s mayor Jacek Majchrowski, and the museum’s first director, Maria Anna Potocka. Italian architects Claudio Nardi and Leonardo Maria Proli won their commission to design the museum in 2007. Work finally began in December 2009, thanks to 35 million złoty of European funding, and was completed earlier this year. The 10,000 square metre gallery stands alongside the Oskar Schindler Enamel Factory, a branch of the Historical Museum of Krakow. Two permanent attractions make up the backbone of MOCAK – the gallery’s own collection and the Mieczysław Porębski library, the latter being potentially accessible for study and research purposes. The library fulfills Porębski’s own wish to donate his collection of books and artifacts to MOCAK, a desire he expressed when the museum was still a vague idea opposed by a skeptical faction within Krakow’s administration. The library also includes significant drawings and small format paintings by Tadeusz Kantor, Tadesz Brzozowski and Jerzy Nowosielski. The Schindler Factory and MOCAK complement each other, representing an awesome two-hit combination at the heart of the bid to free the Zabłocie district of its associations with disused, rusty rails and dilapidated roads. And it’s not just for the tourists – the residents of this part of Podgórze are intended to be the main audience for MOCAK’s educational activities. And education has been built in to MOCAK’s philosophy right from the start, with workshops led by Japanese actor Shinji Ogawa kicking off the programme. The historical significance of the Schindler factory possibly influenced MOCAK director and curator Maria Anna Potocka’s show ‘History in Art,’ which aims to explore the ways in which history builds identity. The exhibition includes 44 pieces, on show on the first floor of the main building. “The point is not to display history replicating the factory function but rather to put its processes into question”, she explained. “The show History in Art includes a bunch of potentially controversial items. 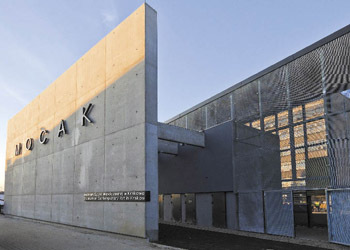 But we refuse to mention them, as it could make the remaining works and exhibitions less visible for the visitors,” she added, commenting on the curatorial philosophy of MOCAK – related to the idea of a ‘diffused museum’ as it was labeled by Nardi during an interview with the Krakow Post prior to the opening. The smaller building of the gallery currently hosts Maurycy Gomulicki’s solo exhibition ‘Bibliophilia.’ Gomulicki’s show consists of a series of images of female bodies in swimsuits, posing nonchalantly against bookcases, and created in the artist’s own studio. ‘Complex B’ is temporarily home to the 15 Polish works selected for the Vordemberge-Gildewart art contest arranged by MOCAK. The show, curated by Delfina Piekarska, also includes the award-winning works of Jan Dziaczkowski, Rosa Liwa and Anna Okraska. MOCAK’s management intends the gallery to grow. They have unveiled details of the exhibition program for 2011, which will include items from the Austrian Essl Museum collection including works by the Vienna Actionists. The intention is also to build on MOCAK’s permanent collection through the acquisition of new pieces.